Falkland Islands is an archipelago located in the Patagonian Shelf in the South Atlantic Ocean, with majority of its islands is mountainous. Falkland Islands, which typically gets huge number of visitors from October to March, is rich in flora and fauna, and is being conserved and maintained beyond expectation. 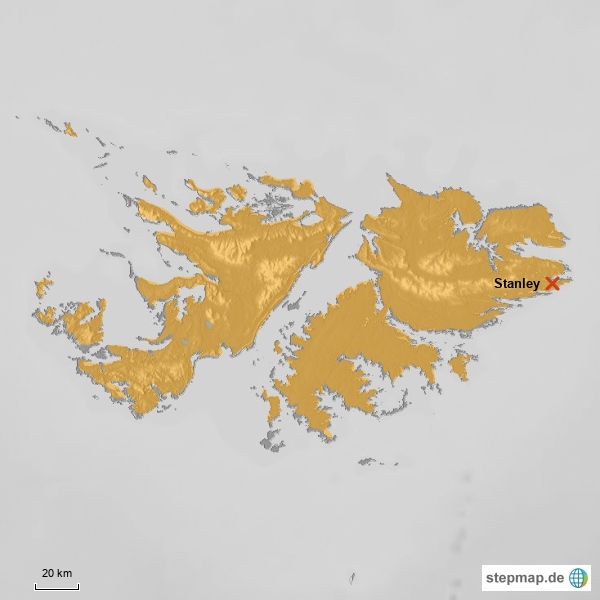 Stanley, which is the capital city of Falkland Islands, is filled with millions of penguins as well as duck buyer and sheep in the greenery. Stanley is being visited by cruise ships every year, with an average of 40 ships in a yeat. Bertha’s Beach, which is one of the top choices for surfing, is also one of the most famous places in Falkland Islands as Bertha’s Beach has a wealthy marine life. Volunteer Point is one of the most visited and famous attractions across Falkland Islands, as it is home to the biggest king penguin colony and gentoo species as well as other bird species. Carcass Island, which is the largest island in the west point of Falkland Islands, is one of the most awe-inspiring places in the county because of its rich nature. This destination is home to small bird species and other marine mammals like seals that inhabit the southern end of the island. Carcass Island is undeniably a wonderful work of nature because of its alluring white fine-sand beaches and rocky hills. Pebble Island, which is the fifth largest island across Falkland archipelago, is believed to be named after the unique-looking stones seen in the western tip of the island. This destination is home to several waterfowls and black-necked swans. Pebble Island has a noticeable mountain range as well as picturesque penguin colonies all over the island. With few colonies of penguins and seals, Sea Lion Island gives its visitors a breathtaking view of nature in Falkland Islands. This destination is known for wildlife watching such as sea lion (where it was named after), elephant seals and other bird species. Sea Lion Island is usually being visited between November and January where most of the whales and other marine mammals are visible. East Falkland is the most populous island in the country, and is divided into two sides - one being covered and surrounded by mountains while the other half is for the flat land that has countless lakes and ponds, which is perfect for relaxing and unwinding. There are also cruise ships nowadays that are stopping at East Falkland for a short exploration. West Falkland Island is the second largest island among all Falkland Islands, but it is surprisingly not heavily inhabited despite its vastness. West Falkland is home to diverse wildlife, picturesque view of nature, and is where Mount Adam can be seen. Outer Island is one of the highlights on every trip to Falkland Islands. This destination has recently been part of cruise liners itineraries, as it offers the best of natural beauty such as its rich flora and fauna. Although almost all of Falklands flora and fauna are not endemic or not native to the region, it still managed to grow and multiply on its own. This destination offer diverse ecosystem where even mosquitoes plays a significant role. Wildlife in Falklands Islands has been rich and diverse over the past years, and its rich marine life is one of the biggest contributors to its beauty.